How effective is electrical stimulation with non-implanted devices in treating overactive bladder? A subset of interim results from a Cochrane review of RCTs. HypothesisTo determine the effectiveness of electrical stimulation (ES) with non-implanted devices for overactive bladder (OAB) in adults compared to other treatments or no active treatment. MethodA systematic review of randomised controlled trials or quasi-RCTs investigating ES for OAB is ongoing. Eligible comparators include sham ES, drugs, placebo, no active treatment, conservative treatment or surgery. Results are presented here for the sham/placebo/no active treatment and drugs comparisons. Studies were identified through the Cochrane Incontinence Group Specialised Register, which contains trials identified from Chochrane Central Register of Controlled Trials, MEDLINE, MEDLINE-in-process, ClinicalTrials.gov, WHO ICTRP and handsearching of journals and conference proceedings (last search December 2014). The primary outcomes were subjective cure or improvement, and quality of life due to OAB or incontinence. Secondary outcomes included symptom quantification, urodynamic outcomes and adverse effects. Two review authors independently screened search results, extracted data and carried out risk of biasassessment. Fixed-effect meta-analyses were undertaken. ResultsTwenty-five eligible studies (1734 participants) were identified; 14 drug studies (five oxybutynin, two trospiumchloride, four tolterodine, one probanthine, one propantheline bromide, one solifenacin succinate) 10 sham ES, two no active treatment and two placebo studies. Three of the 25 studies had multiple comparisons. Approximately half of the studies had low risk of bias for randomisation and the majority were unclear with regard to allocation concealment. There was considerable heterogeneity in the outcomes reported. Data pooled from five studies (n=498) showed significantly more improvement with ES than no active treatment/placebo/sham for OAB symptoms (RR0.58; 95% CI 0.50-0.69; figure 1) and urgency urinary incontinence (UUI) (RR0.65; 95% CI0.54-0.78; figure 2). Based on three studies (n=450), there were more adverse effects with ES but the difference was not significant (RR0.96; 95% CI0.90-1.03). Adverse effects included pain/discomfort, bruising, skin irritation and tingling sensations. Data pooled from four studies (n=104) showed a non-significant difference in favour of ES compared to drugs in OAB symptom improvement (RR0.84; 95% CI0.67-1.07). 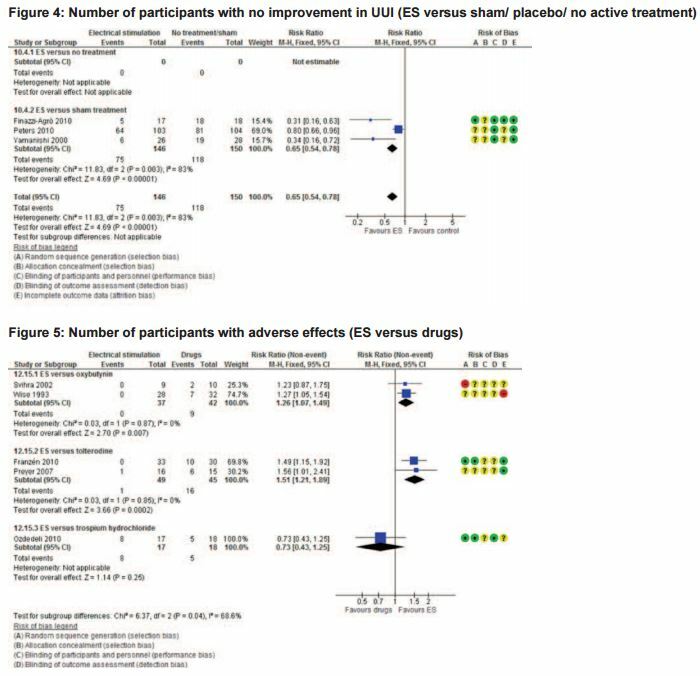 Improvement in UUI was reported in one study (n=64), which showed no significant difference between ES and tolterodine (RR0.94; 95% CI0.43-2.06). Based on five studies (n=208) there were significantly more adverse effects with drug treatment (RR1.27; 95% CI1.11-1.45; figure 3), including dry mouth, blurred vision and constipation. Interpretation of resultsES is more effective than no active treatment, sham treatment or placebo in improving OAB symptoms and UUI. It is less clear if ES is more effective than drugs but it appears that ES incurs fewer adverse effects than drgus. The included studies were of relatively high quality but small sample sizes make it difficult to draw firm conclusions. Heterogeneous outcomes made meaningful comparisons across studies difficult. Concluding messageES with non-implanted devices shows promise for treating OAB symptoms. With fewer adverse effects than drug treatment, ES may be the preferred option for OAB but further trials are warranted to investigate the extent of ES's effectiveness compared to drugs. Future trials should report subjective cure/improvement outcomes consistently.